This summer the Vaudeville Theatre will be showing “The Tiger Who Came to Tea” that is returning to a London in celebration of the book’s 40th anniversary. The show is the adaptation of the well known children’s picture book from Judith Kerr and features songs by the David Wood. 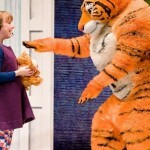 For the first time ever, this much-loved tale of a tiger is brought vividly to life on stage. The show is the ideal introduction to theatre for pre and primary school children and their families. Featuring magic and sing-along songs, ‘The Tiger Who Came to Tea’ is perfect for developing literacy and listening skills, and audience participation is highly encouraged! It is a wonderful place to take the whole family for an introduction to the West End. Expect to be surprised! Suitable for children aged 3+.